Labor and delivery may be the “hard” part of a pregnancy, but newborns and new mothers must be given adequate care in the postpartum period as well. When a doctor, midwife or hospital staff member fails to provide a certain level of postpartum care, you and your new baby could end up with serious illnesses or injuries. 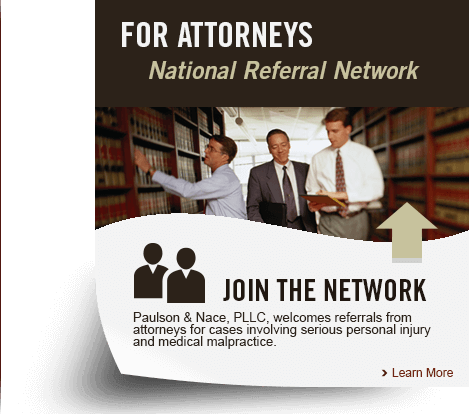 At Paulson & Nace, PLLC, we put your new family’s needs first. We are a skilled father-and-sons team of medical malpractice attorneys who have successfully represented negligence victims throughout Washington, D.C.. If your doctor’s negligent behaviors put your family at risk, we want to help. Some of these risks, such as hemorrhaging, must be addressed immediately, or they could lead to the wrongful death of the mother. Other potential illnesses and injuries can be avoided by monitoring, so that symptoms can be diagnosed quickly. Your newborn must also be monitored continuously for signs of danger, such as respiratory distress or jaundice. Babies should be tested for nerve damage, potential skull fracturing if forceps or a vacuum extractor were used during labor, accelerated or excessively low heart rates, adverse reactions to any antibiotics administered during pregnancy or labor, and low Apgar scores. Failure to diagnose a transmitted infection or treat an underlying condition could lead to lifelong complications, such as developmental delays, or to the tragic death of your child. At Paulson & Nace, we know how dangerous inadequate postpartum care can be. We have helped families in and around Washington, D.C. whose healthcare providers failed to monitor their health, discharged them from the hospital too soon, and failed to treat infections that worsened and spread, among other types of negligent acts. We have secured millions of dollars in compensation for our clients over the last 40 years, helping them obtain the medical treatments and resources they needed to keep their family safe. At Paulson & Nace, PLLC, we protect Washington, D.C. families whose futures have been put at risk by negligent postpartum care. We create options for your future, and keep the lines of communication open. To schedule a no-obligation consultation with one of our dedicated trial attorneys, please call 202-930-0292 or fill out our contact form.